Celebrate the joys of your life with Joie de Vivre. Joie de Vivre brings freelance floral design to your Northshore, New Orleans and Baton Rouge events. We meet, discuss your vision and collaborate to make your floral idea a reality. No storefront means no overhead for me and better prices for you. It also means that flowers are purchased for you and only you, allowing you to benefit from the freshest possible product. Attention and creativity is poured into making your event a memorable one, not just some pretty flowers in a vase. 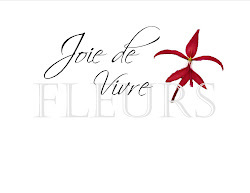 While Joie de Vivre is my business and design is my passion, it all starts with the flower. Hope you enjoy my many ramblings. While bridal magazines inspire us with lush floral extravaganzas, sometimes that lush full look isn’t consistent with a bride’s personal style or budget. When you see a lush, full floral display, remember, each stem is an investment, so it all adds up quickly. Perhaps that lush garden look isn’t your style. There are many of us out there that appreciate the simplicity of a single stem, whether it be the texture of ginger blossom or linear beauty of a few calla lilies swirled in a vase. Why not enhance that one amazing stem and really make it a statement flower by submerging it in water? One single large vase or grouping of vases with a few immaculate stems can really make an impact. Couple the water’s magnification of the blossoms with the light reflected by surrounding candles and you have one memorable table. Now let’s go a step further. How often do you see that submerged stem suspended in water without the use of rocks or floating candles to hold it in place? It’s a very clean look and in this context is completed with a swirling grass accent. (This photo was a trial run for a future project with dendrobium orchids; so remember, never wait to the last minute to test your concept). Clean. Simple. Beautiful. Just remember the glass cleaner as unsightly fingerprints will destroy this pristine look.